IGSHPA is pleased to inform you of the recent success for the industry. The Continuing Resolution spending bill signed by President Trump in the early morning hours Friday, February 9, 2018, includes a measure to extend the tax credits for the industry-both residential and commercial. 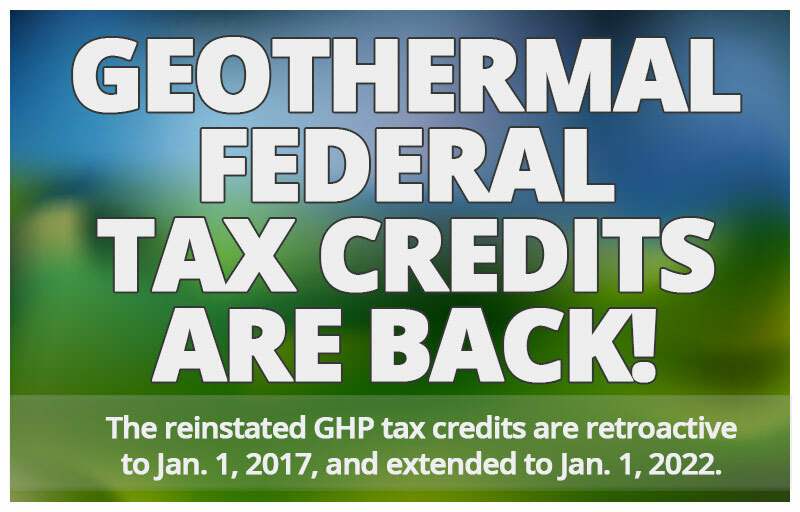 The reinstated tax credits are retroactive to January 1, 2017 and extend to January 1, 2022. A special note of consideration for commercial projects is commercial projects are eligible for the tax credit if commenced by January 1, 2022. The GeoExchange Organization has been on Capitol Hill many times in the last year asking for the extension of the tax credits to ensure our industry receives parity with the solar industry. GEO staff, manufacturers, and members, including IGSHPA and GEO Board Member Michael Albertson and IGSHPA Board Member Cary Smith, among others participated in executive fly-ins to Capitol Hill with GEO and the National Ground Water Association to ask for reinstatement of the tax credits. IGSHPA thanks GEO and everyone who lobbied on Capitol Hill, called and/or emailed their member of Congress, or provided job site and company visits for all of their dedication to this effort. We look forward to growing this industry with you in the coming days.